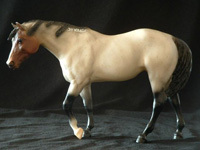 The Indian Pony mold has consistently been in the top ten of popular Breyer Horses, with models such as Breyerfest Celebration Indian Pony Mustang Lady, it's not hard to see why. Here are some of the models that were released in the 90s. 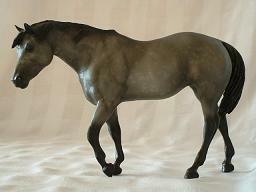 The next Indian Pony model I have owned is the Series Run (SR) from 1991; the Breyerfest Celebration Horse. Her name is "Mustang Lady" and was an Endurance Champion with only 2500 of her made. She is a beautiful matte gray with the white freeze brand on her neck and a red 48 on her left hip. She is simply beautiful and once again, she seems to have wisdom that she carries with her from her previous life. Here is another one of my long awaited finds. She is a 1994 SR German Export named Chinook. There were only 750 of this model made on the Indian Pony mold so she has been rather difficult to come by as her price would also climb so much higher than my pocket would allow me to go. What is it that they say; “good things come to those who wait?” Well, I am glad I did. If you look at her pictures to the right and compare; the one on the top is taken with a flash and Chinook appears to be lighter. The picture on the below is taken without a flash and appears darker. So when you are looking to purchase one of these highly collectible Indian Ponies, be sure to ask about the photo’s provided so that you are not disappointed. In Felicia Browell's 2008 book "Breyer Animal Collector's Guide: Identification and Values" , Chinook is listed with a value of $78. However, I have consistently seen this model sell for between $200-$300, sometimes higher. The next Indian Pony release was in 1995 through 1996 with "Cheyenne American Mustang". 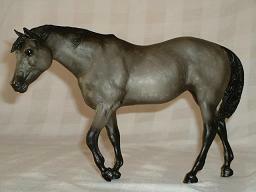 She is a matte roan, I would call her a bay roan, and has the freeze brand on the left side of her neck as well. The freeze brand is typical of the wild mustangs. Once they are caught and inspected, they are freeze branded for identification before they are adopted out.